Something to note: Massie was invited by the Lt. Governor of Missouri and was reportedly excited to debut her song about 9/11 at the 9/12 event. It was never marketed as anything but a tea party event. Sad that the left is so uncomfortable with the idea of a huge grassroots movement which isn’t under the sway of a political party. Independence = less control for big regimes. I guess that would scare some, thus the need to convince others against taking part. Who doesn’t love individual liberty and smaller government? As a conservatarian independent, I look forward to hanging with the Democrats, Republicans, Libertarians, and other indies at the 9/12 event like at every grassroots rally! In the early morning hours of Aug. 17, someone broke a back window in Carnahan’s St. Louis campaign office and set a small fire, which caused minor damage in the office. Police arrested a suspect some hours later. They released him the next day, but have not divulged the suspect’s name. Police say it is up to the prosecutor’s office whether to issue a warrant; without it they can’t hold a suspect or release his name. He says he didn’t, Carnahan says he did. Some lingering questions remain: who ID’d Powers as being the suspect? What of the rumors that he took a polygraph? If Powers did do it, was it because he was a disgruntled employee and lastly, if he was a disgruntled employee crazy enough to try to set a congressman’s office on fire, note that he worked as a canvasser. WTH kind of people are showing up on St. Louis doorsteps on behalf of the Carnahan campaign? 1) If one of their bloggers wasn’t paid and is being framed by a congressman for a federal offense, you’d think they would come to his defense. If this is the case, I feel bad for the dude and this is just one more reason why there needs to be a federal investigation into this incident. 2) If Carnahan is correct and this is a case of a disgruntled employee, another Carnahan campaigner who has engaged in unlawful (Javonne Spitz, et al.) behavior while working for the campaign, then I think there is enough of a pattern to ask whether the campaigns selections of campaign workers are safe choices, not just for his campaign but the community as whole if these people are out there engaging voters. It’s also a reflection upon TPM for not condemning the actions of a writer who provides content, on which they sell ads, for them for free. Make the analogy between TPM not paying Powers and Carnahan allegedly not paying Powers yourself. Regardless, it’s an incredibly bummer of a story any way you look at it. Who to believe? Reid supports the Obama administration’s lawsuit against Arizona over its immigration law, but 63 percent of Nevada voters oppose the lawsuit, according to a Rasmussen poll. Reid voted against a measure to complete a 700-mile fence along the Mexican border in May, but 68 percent of voters nationally support building a border fence, according to Rasmussen. Reid believes if he says it enough the action will Jim Crow minorities into staying with a political ideology that works against, rather than for their interests, such as freedom and opportunity. Backwater sites like Think Progress – who used copyrighted footage for their video sans permission of a crasher and falsely portrayed the crasher in a manner defamatory to the tea party movement – like to omit the fact that the Obama-Hitler signs (to say nothing that it was a trend started by the left and employed by them to this day, but they believe themselves exempt from apology) belong to LaRouchies. The LaRouche loonies set up this “Impeach Obama” location, featuring an image of Obama as Hitler. As this is NOT the way the Tea Party and other Conservative Patriots work, I sought to get some information from this woman so as to draw the contrast between the Larouche organization and real grassroots conservatives. As I approached her, I took a photograph. This set her off, and she began a tirade that I had no right to photograph her without identifying myself. (While she is quite incorrect, as she had set herself up in a public place and made herself a public spectacle – thereby becoming NEWS…) I did identify myself. I then attempted to get SOME comment on video. Not only was she uncommunicative – but while I was sending email on my Blackberry from my car before departing the parking lot – the police arrived (she called them). Of course after explaining that I was simply exercising my first Amendment rights and was simply attempting to get her to comment – and was not intimidating or threatening her. 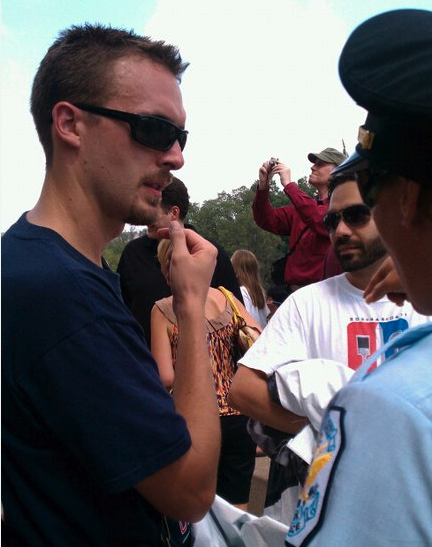 They said they had no problem with me… and as I departed, she was taking down her display in the presence of the cops! Hey, they learned it from the left. In addition, the tea parties are “not really all about average citizens,” the document continues, saying neo-Nazis, militias, secessionists and racists are attending them. What about getting placed on a DHS watch list? Where was the media coverage then? Oh. Right. The left believes freedom is only found on the Democrat plantation, it doesn’t fit the media’s narrative. As I said on King last night, apparently, I’m one of few who’s actually read the original post, watched the original video, and watched the entire 45-minute-15-second video in its entirety. Some points. – The original post and video was to highlight the applause of discrimination towards a white farmer. It was given in context. – The original video was not “doctored” nor “out of context,” and the irony is that those making such statements are actually taking the context away from its original presentation. Sherrod was building to a lesson in her speech – but went on later in her speech to talk about how people who support HCR are racist, essentially. It’s at 23:53 in. Look, I did your homework for you. Um … soooo people who wanted to make their own medical decisions over their own bodies were doing it because they were racist? Why can’t it just be about PEOPLE? PEOPLE, PERIOD? Sherrod is using race to stoke class warfare and promote Marxist principles. The dude from the Daily Beast on last night’s panel committed a massive facepalm when he tried to deny this in defense of Sherrod but went on to parrot her remarks as a way to push the need for economic equality. You don’t achieve equality by tearing everyone down equally. You promote equality by giving people the opportunity to exercise their free will and make of themselves what they will. You promote equality by not killing school choice by way of vouchers, or killing small business with penalties via health control. This began because the left is losing in the arena of public opinion. So they double-down on race and make an already hyper-paranoid state of racial awareness even crazier. In a rock-throwing fight in a climate they created, they took out one of their political own. The White House, the USDA fired Sherrod, not Andrew Breitbart, not Fox News, not anyone else. Liberals, unable to hold a government in which they’ve invested the entirety of their credibility, deflect and attack conservatives for holding the story up – not their own ideology which tried to spear a movement which now encompasses half the country and has gone mainstream – so they don’t have to implicate their own rhetoric. Doing so would mean they have to back down and debate their policies on merit, and, as you can see from the accumulating public opinion, you’re not going to convince folks to support big government and wasteful spending. It also shows the litmus test of the left: they’re only willing to come to the aid of a black American if that American shares their liberal ideology. Obama didn’t call Kenneth Gladney after he was beaten, he didn’t call Cedra Crenshaw when the Chicago machine got scared of a conservative black woman entering their ring and tried to run her (unsuccessfully) off the ballot. The grassroots movement shares more in common with the communities that the left tries to exploit than the left shares with them. All of this is smoke and mirrors to obfuscate the truth. That’s not empowering, liberating, freeing, nor choice. Do a story on that, Cooper.